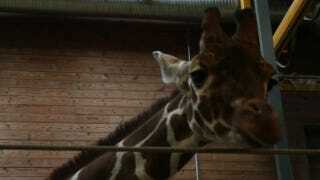 Hours ago, 18-month-old Marius the giraffe was put down at the Copenhagen Zoo. Despite a last-minute offer from an English zoo to rehome him, Marius was killed in the manner of so many cattle, his body is slated to be fed to zoo lions this afternoon. The Copenhagen Zoo is a part of the European Association of Zoos and Aquaria (EAZA), which is running a giraffe breeding program. But giraffes, unlike giant pandas, are apparently super-easy to breed, so zoos can afford to be picky. And are apparently also required to be picky. As this giraffe's genes are well represented in the breeding programme and as there is no place for the giraffe in the Zoo's giraffe herd, the European Breeding Programme for Giraffes has agreed that Copenhagen Zoo euthanize the giraffe. Although Marius himself was healthy, should he happen to mate with other EAZA giraffes, his offspring (or later descendants) might not be. And although the UK's Yorkshire Wildlife Park had offered to take him off the EAZA's hands, saving Marius' life without risk of breeding population contamination, the EAZA thought it would be better if they chose to house an EAZA breeder instead. Image of Marius from the BBC.